Current Distribution: By 1994, the beetle was commonly found throughout the continental U.S. and Canada. It has also been intercepted on a plane full of Christmas trees otherwise bound for Hawaii. Site and Date of Introduction: Between the late 1910’s and the mid-1970's, there were several planned and accidental introductions to the U.S., with no survival. Many planned releases across the eastern U.S. in the late 1970's and early 1980's were attempts to use the beetles to help control aphids and scales. After years without a sighting, the beetle was seen in Louisiana in 1988. Whether this final, successful colonization was due to a planned release or an accidental introduction is under debate. Mode(s) of Introduction: Released either by U.S.D.A. Agricultural Research Service or accidentally via a ship from Asia. Reason(s) Why it has Become Established: Each female Asian Ladybird Beetle lays 500-700 eggs; there are several generations per year and the beetles live about three years. They have no native natural enemies and birds assume from their warning coloration that they taste bad. They also play dead when in danger, and most predators will not eat a “dead” insect. Finally, their “bad smell,” produced possibly by a fluid in their leg joints, drives predators away. The larva is covered with bumps and spines and boasts sickle-shaped jaws that produce a distinct bite. In addition to appearance, the beetles have adapted to our climate quite well and can live in trees and shrubs, fields, on beaches and in houses. 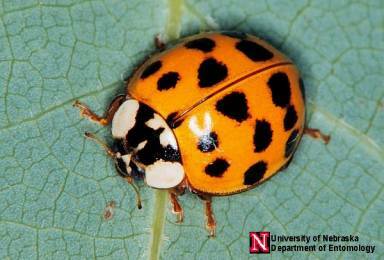 Ecological Role: The Asian Lady Beetle was introduced as a biological control against crop pests. The larvae are larger than most native ladybird larvae and both adults and larvae consume aphids. It is a ravenous predator of arthropod pests such as aphids, mites, thrips, scale and Lepidoptera eggs. Benefit(s): The Asian Ladybird Beetle is beneficial for most of the year; it has contributed to a decrease in pesticide use on many crops and in orchards. Threat(s): Asian Ladybird Beetles are anecdotally suspected to be responsible for a decrease in the numbers of native beneficial insects through predation and by elimination of scarce prey, although this has not been scientifically proven. On a lesser “threat” level, the beetles seek shelter for overwintering, and when a location is found, they emit an "aggregating pheromone" to attract other beetles. Often, they choose a human home and gather in the dozens, hundreds or thousands. They remain in that location through the winter, annoying humans with their numbers, smell, and biting. The yellow, odorous defensive compound may also stain furniture, carpets and draperies. Control Level Diagnosis: Minimal Priority, since they are clearly valuable as enemies of many pests, although their possible cannibalism of other insects should be studied. Control Method: Homeowners who have experienced an overabundance of the beetles should seal up all the cracks in the foundation or siding of their home. If they enter the home, the best option is to use black light traps at night. They can also be gently vacuumed up using a less powerful vacuum. (The beetles should never be swept, since the broom can rupture their bodies, and their blood smells). If the beetles are trapped in a clean vacuum bag, they can be stored in a cool spot and released in the spring. University of Florida, Department of Entomology (www.creatures.ifas.ufl.edu).